Discussion in 'iPhone Forum' started by Azzin, Feb 26, 2013. However, I'd like to get it from Amazon as I'm in credit with some gift vouchers, but they don't yet have stock. £15 and my giftcard credit will cover the cost, so I may give it a go and see if it's any good, unless anyone here's got any alternative suggestions? Not keen on importing it though after being stung with customs and VAT after importing a SurfacePad case. Unless I'm missing something, that doesn't have a charging port? Nope no charging port it's just a stand. I use it for sitting my iPhone in. I have 2 actually for work and home. It's a bit of a pain, but it'll do for now. Just seen this one spring up. I just don't like docks that allow the iPhone 5 to sit upright, with virtually no back support. The worry for me is that if I reach over and knock the phone, it's possible that as it pushes back, the Lightning port will get damaged. The more I see of it, the more the Belkin looks like the one to get. This looks nice, but it appears to only take a naked iPhone. It's £5 more than the other Belkin unit, but comes hard wired with a Lightning connector/cable. Seems to be the best one. I can't find anything else. I might go for one of these as well. I was in my local Apple store this afternoon on my lunch, and saw this. Looks good. I thought you didn't like docks that were supported solely by the Lightning connector? You'd need a very fat case to stop this from being the case on this dock, judging by the side-on view. Agreed, but for it to be supported by anything other than the connector, you'd need a case that adds half the thickness of the iPhone 5 onto it again. I personally don't have a problem with it, the connector provides plenty of support, but I understood your posts above as you did have a problem with docks that didn't support the back of the iPhone 5, so thought it was worth mentioning. Well, despite saying it is "Case compatible", it turns out that the Belkin Charge and Sync iPhone Dock with Lightning Connector is in fact, not, as I can't get it to acknowledge my phone, even in the super slim case that is the Poetic Atmosphere (works fine out of the case). Back to Amazon it goes. The thing is, it specifically says "case compatible". My Poetic Atmosphere is one of the thinnest cases around, so if it won't charge with that case, what chance is there it will charge with any case? Has anyone tried one of these? I thought that as you have to put the cable in yourself there may be chance to get it to work with a case? I'm also looking for a dock but do not want one that offers no back support. Looking at the ones in those docks above and I just fear the connection either on the case or internally on the phone will get damaged by it sitting that way. The Belkin one has a nice big back for support, but yet none of it actually touches the phone! So what's the point in having it in the first place?! 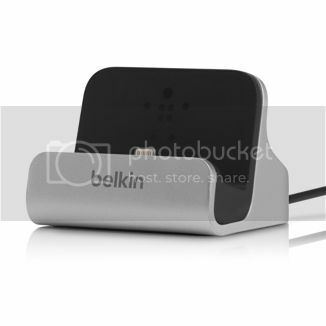 I've just bought the Belkin Dock (#1) from those nice people in the Apple shop in the Bullring. They were good enough to take it out of the sealed box and let me try before I bought it. As you can see from the attached pics, the width/depth of the case is unlikely to be an issue. I use a gel case (Prepaymania) and although it's not the thinnest case available it's not the fattest either. There's plenty of room front and back for a fatter case. The Lightning connector is permanently attached to a rubber block (#2) so that it flexes/swivels and allows the iPhone to rest securely against the back of the dock (# 3 & 4) providing better support than the original Apple Universal Dock and certainly won't stress the connector or the dock. The issue about compatibility is to do with the bottom of the case and access to the Lightning dock. If your case has a fully exposed cut-out like mine (#5) then it works no problem. On the other hand if the cut-outs are shaped and covered (e.g. #6 and #7) then it's probably not going to work. The rule of thumb is likely to be that if your case doesn't work with a Lightning/30pin adaptor then it won't work with this. Seems a good quality piece of kit. £29.99 from Apple including the lead (would cost £14.99) seems pretty good vfm. Am looking for both a case for my iphone 5 and a charging dock. I will be using the dock at my office so it needs to be smart/elegant. I have done quite a bit of research and it seems as if at the moment it is quite difficult to find a dock that works without having to remove the case. If you do have a dock and use it without taking the case off, I would be grateful to hear from you so I can see which combinations work. Have you seen the pics two posts above yours? I just had that email too. Hopefully the Apple Store will have them soon. I'm not going to import one like the SurfacePad case, cost a fortune.